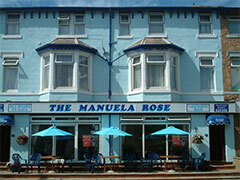 Whatever your reason for visiting Blackpool A warm and friendly welcome awaits you at The Manuela Rose. Illuminations, business, pleasure or just a break - The Manuela Rose can cater for all your needs. The Manuela Rose is ideally situated in the heart of Blackpool within five minutes walk from many tourist attractions. Including: Central Pier, Blackpool Tower, The Sea Life Centre, The Winter Gardens Complex, Blackpool's newly rebuilt Town Centre Shopping Area, Theatres and Nightclubs. From the moment you enter the hotel you are assured of a hearty welcome and a warm friendly atmosphere. Your comfort is the personal concern of the resident proprietors: Kevin and Pat, who pride themselves on their high standard of cleanliness and good old fashioned home cooking, which has resulted in a very high proportion of repeat bookings. Here they can assure you of the same courteous customer care, outstanding accommodation and food that you will want to tell your friends about. You have access to the Hotel and to your room at anytime during the day and a late key is provided should you wish to sample the fabulous night life of Blackpool's many late night Cabaret and Night Clubs.